A modeling chocolate recipe that that has no lumps, is smooth and easy to work with. Can be made from candy melts (melties) or real chocolate. Used by the pros. Melt candy melts in a plastic or microwave-safe bowl in microwave or stove-top sauce pan. Warm corn syrup and add food coloring.Remember that your final product will be lighter than the color of your corn syrup.You can also add color later if you want. Your chocolate will be hard every time you go to use it and you will need to re-heat it a few seconds (5-15 depending on your microwave) before each use. Do not over heat or it will get too soft and you'll have to wait for it to harden up again before you can use it. A lot of people struggle with modeling chocolate. It’s either too dry, too soft or somewhere in the middle. We all know that perfect modeling chocolate recipe must be out there somewhere because if it wasn’t, why would people keep using it? 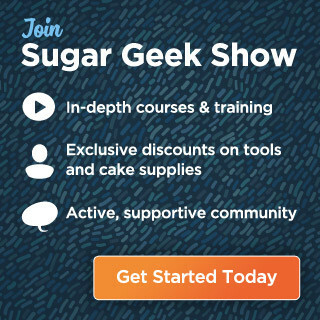 A new updated recipe of my modeling chocolate can be found on Sugar Geek Show. If I want different colors, do I have to make a bunch of batches? I don’t have a microwave. How can I reheat? Hi Liz, I love your work! I am wondering what product you recommend for coloring your modeling chocolate if you are using real chocolate and do you need to adjust the recipe for the extra moisture coloring might add? Would you use modeling chocolate to make chocolate sails? Hi – Is this modeling chocolate suitable for covering a basic cake, in replacement of fondant? Can this be used to cover rice krispie treat and then covered with fondant? What do I do if my modeling chocolate is oily? My chocolate is very runny & oily I used the correct measurements. And it got that way before I even was able to fold it all in. How do I fix? What am I doing wrong? Hi after I have made the planned mould or structure how do I store it? I have to make many little animals over the next three weeks. Does the chocolate get stored at room temp or can it be refrigerated? Hey liz i am making modelling chocolate using compound white chocolate i.e cooking chocolate so ill follow the melts recipe ? Can I knead coloring into the modeling chocolate after I make it? Hi Liz – can you tell me what I’m doing wrong?!?! The last 3 bags of Wilton white candy melts I’ve tried melting just turn into one big clump of chocolate – not liquid AT ALL! I’m microwaving in short (30sec) bursts on 50% power. So frustrating! I noticed that you use modelling chocolate to cover sculpted cake. Any particular reason? I have a question about a batch of modeling chocolate I messed up and am hoping to salvage. I accidentally used too much corn syrup: I thought I was using 3 lbs of chocolate, so I added 1 1/2cups corn syrup, but I actually just had albs of chocolate. I stirred it out like normal and realized my error when I poured it onto plastic to wrap up. I’ve left it overnight, and now I’m faced with a lot of REALLY soft almost-modeling chocolate (it seized like usual, but today I have yet to knead it to get that final product). Any thoughts about how to save it, or what to do with it? ps: I bought your book a while ago and am really enjoying it—especially the parts about color. So interesting to read about cake decorating from the perspective of a graphic designer! How many pounds of modeling chocolate are needed to cover a 3 tier wedding cake? how warm does syrup suppose to be? and after i cover my cupcakes with modeling chocolate, will the chocolate get hard, or will it stay soft?? 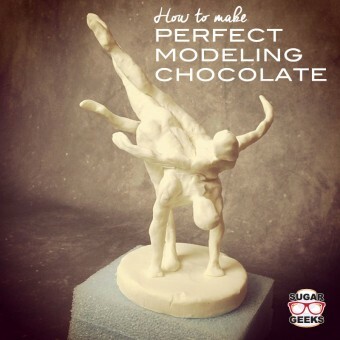 Will the chocolate…or is the chocolate supposed to get hard after you use it to make your model or topper? Or is it supposed to stay a bit soft? I’m sure either way. can u use this when you knead it the first time or do you need to let it set until it gets completely hard then use it? And how long does this last? Can you put it in the freezer? Freeze it! It can stay in good shape for at least a year—when you want to use it again, just leave it on the counter overnight to let it thaw, then knead it as usual.